Locatin:Wuzhai Shan Mountain, in the Zhifang Township of Jiaxiang County, Shandong Province. The scene is divided into four registers: The first register (from left to right) illustrates four stories involving the wife of King Chao of Ch'u, the righteous aunt of Lu, the chaste wife of Ch'iu Hu, and the beautiful widow Liang Kaohsing. The second register (from left to right) illustrates six stories concerning the Hsiungnu King, Hsiu T'u, Li Shan, Chu Ming, Tung Yung, Hsing Ch'ü and Poyü The images in the center of the third and four registers show a homage scene. Left of the pavilion is a scene of archers taking aim at birds and monkeys, may be a rebus for achieving high office. Above and to the left of the pavilion (third register) are two standing men holding pienmien fans and facing to the right, three men standing in the middle cupping hands in front of their chest, and two kneeling figures holding hu tablets which are facing left. 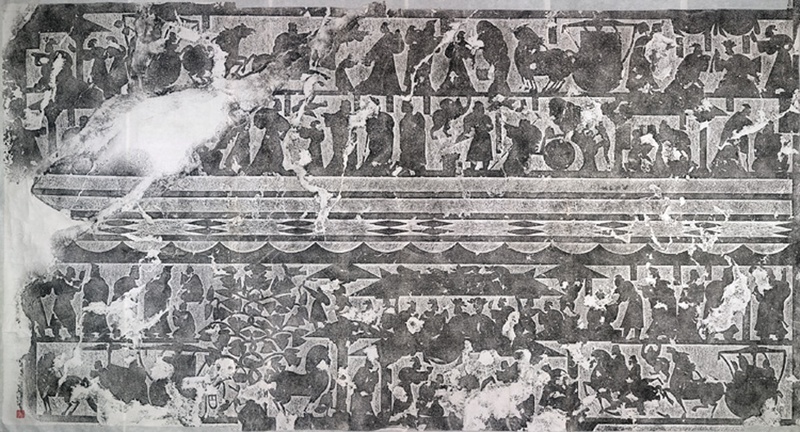 The lower left (fourth register) is a scene depicting a chariot procession. To the right of the pavilion, the upper register (third register) illustrates the stories of Fan Sui sparing the life of Hsü Chia, and Lin Hsiangju negotiating with the King of Ch'in. The lower register (fourth register) shows a chariot procession.